Gluten-free diets are those that omit the protein gluten, which is found in wheat, barley, rye and a cross between wheat and rye known a triticale. A gluten-free diet is used to combat celiac disease, a potentially serious condition that prevents absorption of some nutrients. It can cause everything from weight loss to depriving the brain, nervous system, bones, liver and other organs of vital nourishment. Some people, the Mayo experts say, may not have full-fledged celiac disease but may have some symptoms. That is known as non-celiac gluten sensitivity. People with that condition may benefit from a gluten-free diet. But for people with celiac disease, a gluten-free diet is essential for preventing symptoms and related complications. Although a gluten-free diet might seem restrictive, the Mayo experts say there are many foods you can eat, including: unprocessed beans, seeds and nuts; fresh eggs; fresh meats, fish and poultry (no batter or breading); fruits and vegetables; and many dairy products. But, the experts say, you have to make sure that food isn’t processed with gluten-containing grains, additives or preservatives. A list of safe grains provided by Mayo include amaranth; arrowroot; buckwheat; corn and corn meal; flax; gluten-free flours such as rice, soy, corn, potato, bean; hominy; millet; quinoa; rice; sorghum; soy; tapioca; and teff. The experts also say it’s essential to avoid foods and drinks made with barley; malt; rye; triticale; and wheat. Some other wheat products include durum flour; farina; graham flour; kamut; semolina; and spelt. Some oats are contaminated with wheat during production; doctors and dietitians advise avoiding oats unless they are labeled gluten free. In general, the Mayo experts recommend, avoid the following foods unless they’re labeled as gluten-free or made with corn, rice, soy or other gluten-free grain: beer; breads; cakes; pies; candies; cereals; Communion waters; cookies; crackers; croutons; French fries; gravies; imitation meat or seafood; matzo; pastas; processed lunch meats; salad dressings; sauces (including soy sauces); seasoned rice mixes; seasoned snack food such as potato chips; self-basting poultry; soups and soup bases; and vegetables in sauce. You should also be alert for other products that you eat or that could come in contact with your mouth that may contain gluten. These include food additives such as malt flavoring as well as medicines and vitamins that use gluten as a binding agent. Foods may also be labeled as “gluten-free.” If a product carries a gluten-free label, the Food and Drug Administration requires that the product contain less than 20 parts per million of gluten. Be aware that products labeled “wheat-free” may still contain gluten. 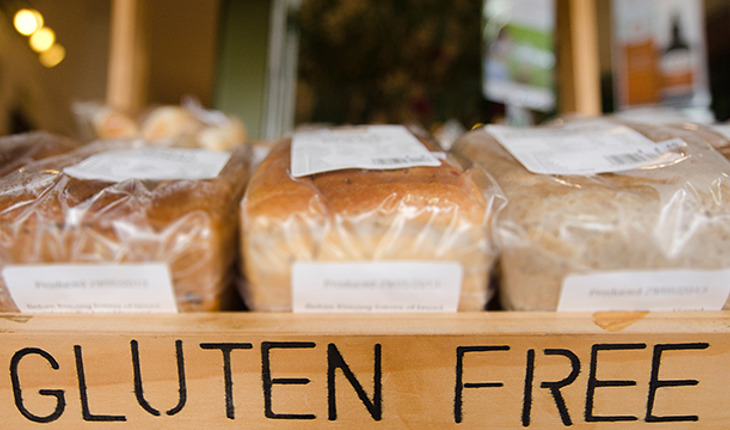 If you’re not sure if a food contains gluten, check with the manufacturer, or don’t buy it.